Cleyndert, smiling as ever, looked quietly confident after he and navigator Leigh Powley had climbed the leader board to second on Friday but acknowledged Crosby’s bad luck.” It is a shame for Paul and Ali, but it’s far from over!” When Leigh Powley was asked if the duo could now win the event, Leigh became quite circumspect, “There is still a long way to go and anything can happen as we have already seen.” Bill added; “It’s way too early to call that!”. Peter Lovett and David Richards also hit problems on the TC section; Peter said “ We had some brake issues in there which affected my confidence, I kept thinking the last thing I want to do is go off with the Chairman of Motorsport UK in the hot seat!” The Frazer Nash BMW however, was still sounding crisp as the pair retained their podium place for third overnight. Car number 36 is still the car to watch, both on the tests and regularities as well as the results sheet. The spirited driving of Theo Hunt with James Galliver navigating is a joy to behold. Their push in the 1933 Frazer Nash TT Replica is paying off as they are up to fourth! Theo was pleased they were making such progress. “ We really enjoyed the plantation section even though it was so slippy, that’s when we are really trying to use the lightness and handling of our car to beat the bigger machines.” Sideways to glory appears to be their motto as a giant killing act could be on the cards by the finish in Gleneagles. Happy results abound at the end of day two. 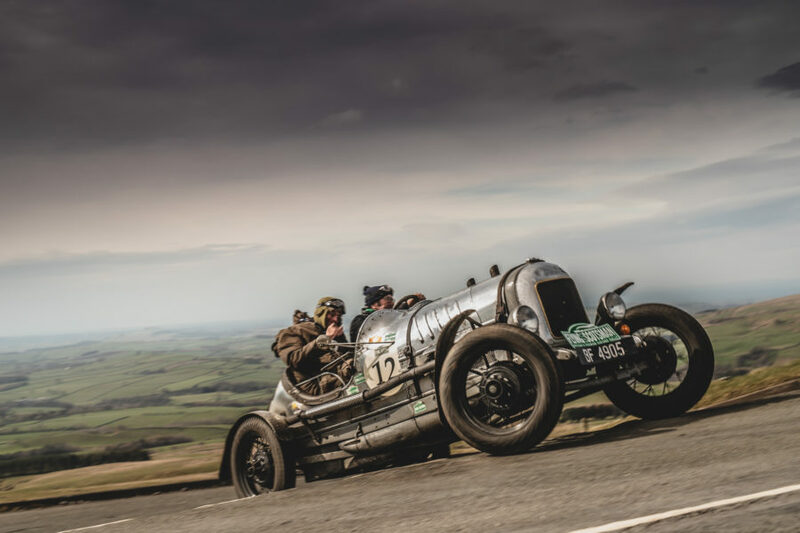 Andrew and Phillippa Bailey who secretly got married just before the Flying Scotsman are really enjoying their Minimoon as they are currently fifth overall in their 1923 Bentley Super Sports. If they can hold the place to the finish they should get quite a reception, but at least it won’t be in private this time! Day two has been challenging but really enjoyable for most, five big regularities and four special tests over a variety of terrain and distance. From the back bone of England, the Peninnes through to the borders and real rally country around Kershope and Kershaw forests, the crews were challenged on a TC section on military land together with slippy grassy tracks through plantations. Scotland was bathed in sunshine for most of the afternoon as the crews wound their way across the hills and through the beautiful scenery of Glentrool. On the way there was a treat for teams as they passed through Langholm in Dumfries and Galloway, as a local pipe band were in full swing in the small square right by the road. Englishman Graeme Brown who is navigating Hugh Apthorp’s Bentley Four and a half litre cut quite a dash as he got into the Scottish swing wearing a kilt under his great coat. The can of Castrol oil in his right hand as Hugh undid the bolt plates to top up the gearbox, didn’t quite fit with his attire though! Graeme was impressed by the forest regularity sections after the first test of the day at Slaley Hall. “They were pretty frisky”. There was good news at midnight last night for Alan Beardshaw and Peter Fletcher. Their 1934 Aston Martin Ulster that all but gave up the ghost yesterday was treated to a new distributor, plug leads and coil putting it right back into action after their preparation man drove three hundred miles to come and fix it! The overnight rest halt at the Trump Turnberry Resort has provided a special area for the Pioneer, Vintage and Vintageant cars left in the event. It is a tribute to them that just six have retired from the original 93 starters although there was still a lot of fettling going on late into the night to prepare the cars for the final day of the 700 mile competition. The Thompson brothers, Anthony and Peter arrived at Turnberry with their left rear leaf spring tied together with a strap: “ We’ll get to Gleneagles even if it’s on a tow rope” said Anthony. Belgians Willy van Loon and Koen van den Broeck summed up the love that competitors have for the Flying Scotsman. Willy said, “I have done many different events but the Flying Scotsman is my favourite. Yes with all the regularities and tests it’s tough, but it’s also quite nice, in fact it’s super but we don’t come to compete at the front”. Koen added, “it’s great to be a part of it we really love it.” But was the navigation hard? “ No, no it’s quite easy really!” Both fell about laughing. Now it’s all eyes front as the battle for the lead of the 2019 Flying Scotsman on the final day resumes between Bill Cleyndert and Paul Crosby, or could Peter Lovett intervene?